Applications for summer 2016 courses are now being accepted via our online application system, myRBS. Applications for Rare Book School courses are considered on a rolling basis until a course has reached enrollment capacity. To be considered for the first round of admissions decisions, submit your application(s) for summer courses by 29 February. Rare Book School and the Antiquarian Booksellers’ Association of America (ABAA) are co-sponsoring a one-day seminar series at the North Bennet Street School in Boston, MA on Wednesday, 11 November 2015 (just prior to the Boston International Antiquarian Book Fair). These seminars have been designed to be of interest to book collectors and booksellers, but signup is open to anyone with an interest in the topics covered. The cost to attend the seminar series is $300. Seminar instructors will be Terry Belanger, Don Lindgren, Nina Musinsky, Todd Pattison, and David Whitesell. As space is limited, registration for the seminar series will be handled on a first-come, first-served basis. As part of the signup process, you will be asked to rank your choices for each concurrent session, and these will be assigned until each seminar has reached capacity. We encourage “early bird” signup before 18 September, to improve your chances of getting a seat in your top-choice seminars. Participants will also receive a complimentary pass to the Boston International Antiquarian Book Fair. See the event page for a full schedule, seminar descriptions, and a link to the signup form. See the full announcement from CLIR. Book Production and Social Practice in Early Modern Europe and America, taught by Ann Blair and David D. Hall at the Houghton Library, Harvard University. The Art of the Book in Edo and Meiji Japan, 1615–1912, taught by Ellis Tinios at the Harvard Art Museums. Applications for Rare Book School courses are considered on a rolling basis until a course has reached enrollment capacity. To be considered for the first round of admissions decisions for December courses, submit your application(s) by 1 September. See the Apply to RBS courses page for more details. We are very pleased to announce that Ruth-Ellen St. Onge has joined the Rare Book School staff as Assistant Curator of Collections and Special Assistant to the Associate Director. 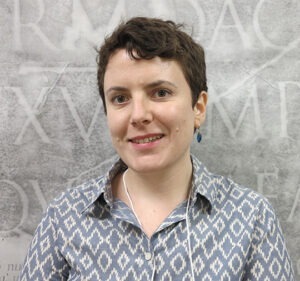 Ruth-Ellen holds a Master of Information Studies and a Ph.D. in French Studies and Book History and Print Culture from the University of Toronto. She is an active council member of the Bibliographical Society of Canada and the Canadian Association for the Study of Book Culture, and is the author of several published articles and reviews. For ten years, while pursuing her undergraduate and graduate studies, Ruth-Ellen worked as a research assistant in the Joseph Sablé Centre for 19th Century French Studies, a rare book library and research collection now housed within the Special Collections of the University of St. Michael’s College in Toronto. Her book-related interests include special collections librarianship; letterpress printing; and the history of publishing, illustration, and typography. 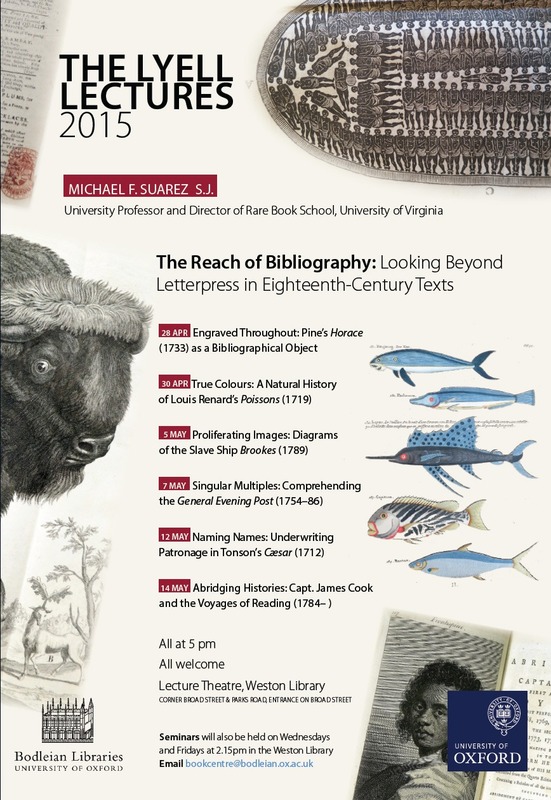 The staff at Rare Book School are thrilled to announce the exciting lineup for this summer’s lecture series at the University of Virginia. The lectures are free and open to the public. All talks will take place at 5:30 p.m. in the Auditorium of the Albert and Shirley Small Special Collections Library (unless otherwise noted). Lectures will last 30–40 minutes with 10 minutes for Q&A, and will be followed by a reception in the RBS space on the first floor of Alderman Library (Alderman 118). Monday, 8 June: William Zachs, Honorary Fellow, University of Edinburgh: The Rev. Hugh Blair (1718–1800): The J. K. Rowling of Eighteenth-Century Britain? Monday, 15 June: Nancy Tomasko, Independent Scholar: Oh, so THIS is Chinese Paper! Wednesday, 22 July: Jerome E. Singerman, Senior Humanities Editor, University of Pennsylvania Press: Scholarly Publishing at the Crossroads: or, How Do We Move Forward Without Getting Run Over? We are very grateful to our 2015 summer lecture sponsors: the Mid-Atlantic Chapter of the Antiquarian Booksellers Association of America (sponsoring the 8 June lecture by William Zachs); and the Southeast Chapter of the Antiquarian Booksellers Association of America (sponsoring the 8 July lecture by Kenneth Karmiole). For information on lectures at other RBS course locations, or to listen to past lectures, see www.rarebookschool.org/lectures. Each of the fellows will attend an RBS course this summer, and will submit a final fellowship project by 15 April 2016. Rare Book School Director Michael F. Suarez, S.J. will deliver a series of six Lyell Lectures at the University of Oxford’s Weston Library beginning on 28 April. All lectures are free and open to the public, but space is limited and advance registration is required. Following the talk, until 7 p.m., participants are invited to lend a hand with one of the Folger Shakespeare Library’s new and exciting digital humanities endeavors: the Early Modern Manuscripts Online (EMMO) project. Come learn about paleography and try out user-friendly software tools as you transcribe manuscripts from the sixteenth and seventeenth centuries. Beginners and experts are welcome: Folger staff and UVA graduate students will be on hand to assist in all aspects of creating transcriptions, and “mini-races” will be held throughout the day (there will be prizes!). Stop in to try a few words and learn about the process, or make a day of it. See the Folger blog post EMMO: Early Modern Manuscripts Online for more about the project, or read about the previous transcribathon, held at the University of Pennsylvania in December.